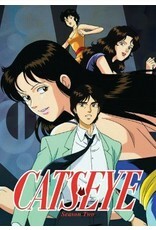 Together, Hitomi, Rui, and Ai are Cat's Eye, the greatest art thieves Japan has ever known. But they don't steal for money or fame - they do it in the hopes of finding their father, a great painter who went missing after World War II. While they're off searching for him in Europe, a new female thief claiming to be Cat's Eye starts wreaking havoc in Tokyo! She steals anything she can get her hands on, and her brutal methods are putting the lives of the police at risk... It's time for the real Cat's Eye to head back to Japan and bring her reign of terror to an end!